Kirk Steudle (above, right, in photo by Georgia DOT), the retiring director of the Michigan Department of Transportation, was given a Special Presidential Merit Award at the American Association of State Highway and Transportation Officials annual meeting Sept. 20-24 in Atlanta. The award recognized Steudle’s 31-year career with the Michigan DOT that encompassed a range of accomplishments, including establishing the first public-private partnership for freeway lighting, the state’s first use of the “bridge slide” construction technique, and the launch of “MCity,” a facility dedicated to connected and autonomous vehicle or CAV research. Blaine Leonard with the Utah Department of Transportation won the Alfred E. Johnson Achievement Award during the American Association of State Highway and Transportation Officials annual meeting for his longtime work with connected-autonomous vehicles or CAVs. 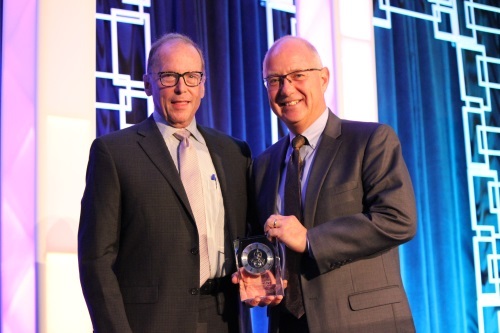 Malcolm Dougherty, the now-retired executive director of the California Department of Transportation, took home the group’s Thomas H. MacDonald Memorial Award for his leadership role in promoting innovation, sustainability, and technology during his career at the agency. AASHTO also gave its Francis B. Francois Award to the Utah Department of Transportation for the technological achievements associated with its Utah Connected Vehicle Smart Transit Signal Priority Project.